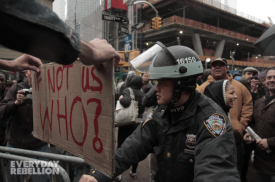 The film, which premiered in competition at CPH:DOX festival in Copenhagen, demonstrates the power, history, influence of non-violent protesting, showing how such disobedience creative as well as influential as boundaries are pushed and points well made. The film details not just the protests themselves but where the ideas behind them are formulated in a philosophy leading to immediate action. Occupy movement in the US, protesters from FEMEN group in the Ukraine, movements in Spain, Iran, Syria are all represented, and there are also interviews with Lisa Fithian, Srja Popovic, Dr Massumeh Torfeh, as well as a worried member of FEMEN who has to escape from Kiev when the secret police came for her.”Everyday Rebellion” is celebrating and the fact that passionate peaceful activists can try – and sometimes succeed – in changing the world.